Dr. Hasan Abbas, Palliative Medicine Consultant at King Abdullah Medical City in Mecca, Saudi Arabia, died unexpectedly on November 18, 2012. The palliative care community mourns his loss, and The International Programs at San Diego Hospice and the Institute for Palliative Medicine have lost a dear friend and member of our global family. Along with Dr. Mohammad Bushnaq, Hasan helped to start the Division of Palliative Medicine at the King Hussein Cancer Center in Amman, the first hospital to deliver palliative care in Jordan. An Internist, Hasan was the second person to become an International Palliative Medicine Fellow (2006-2008). Hasan was a strong advocate for and pioneer in palliative medicine in the Middle East. He strove to care for all people who need palliative care, and worked especially hard to remove barriers to care for those of Muslim faith. We are indebted to Hasan for teaching us about providing palliative care in the Muslim context, for his thoughtfulness as we evolved the international fellowship program, for his generous spirit, and for his wonderful sense of humor. Our thoughts and sympathies are with Hasan’s family, friends, and colleagues. If you would like to contact Hasan’s family, you can send his wife an email at layanabbas@hotmail.com. 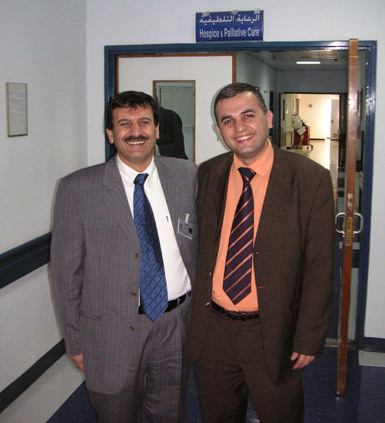 Dr. Hasan Abbas and Dr. Mohammad Bushnaq in front of the first palliative care unit at King Hussein Cancer Center in Amman, Jordan.